New bike lanes along South Lakes Drive between Twin Branches and Ridge Heights and between Soapstone Drive and Colts Neck Road have ignited fury and concerns from area residents. The area which has been re-striped is near South Lakes High School, prompting school officials to encourage commuters to exercise caution when traveling in the area, especially as county schools opened Tuesday. Signs and markings were installed on Monday. Reston residents said the new lane configuration has resulted in confusion, especially during school hours. The lloss of one travel lane has caused significant backups, residents told Reston Now. “As the density and overall population increases in Reston with residences and businesses our infrastructure for handling traffic at peak times shouldn’t be truncated by this so-called road ‘diet,'” said Joann Miller, a Reston resident. Miller suggested maintaining two existing traffic lanes in each direction and adding a dedicated bike lane in each direction, adding that she was in support of bike lanes so long as they were responsibly designed. Confused by the new pattern, some commuters have traveled in the narrow right lane on the road. Others are avoiding the area altogether, when possible. 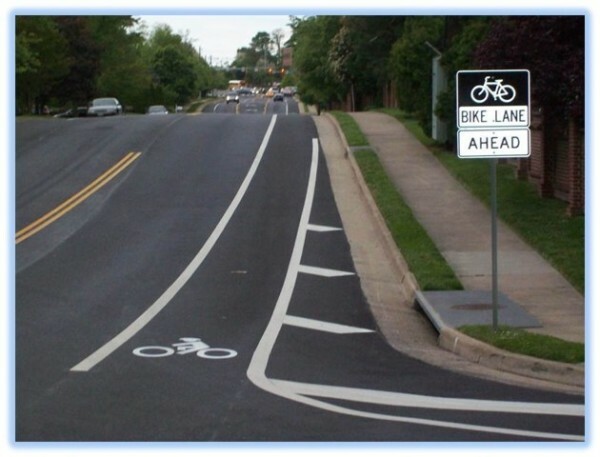 “I told my kids to take Soapstone [Drive] to get to the school now in order to avoid the confusion that these new lanes marketing are going to cause,” said Kathy Brown, a Reston resident. Others in favor of the bike lanes said state’s communication about re-striping was limited and poorly executed as school begins. “I have already noticed delays in turning left onto South Lakes Drive from my home next to South Lakes Village Center. With two lanes of traffic, it is easier to exit and turn left because half of the traffic is in the right lane. By taking away a lane, turning left will take longer because any traffic coming in the same direction will have to pass first,” wrote Pat Maloney, a Reston resident. On Ridge Heights Road, state and local officials proposed redesigning the road between Reston Parkway and Sunrise Valley Drive due to concerns about speeding, limiting sight distance for cars turning onto Sunrise Valley Drive, and pedestrian access. According to the county, no convenient east-west bike route existed in the corridor. Re-striping on South Lakes Drive involved converting the outside travel lane into a buffered bike lane, an alternative that county officials believe is an “effective safety improvement for people that are driving, biking and walking.” State and local officials have extended bike lanes on South Lakes Drive between Reston Parkway and Sanibel Drive. On-street parking on both sides of the roadway will remain without impacting capacity on the road. Current roadway changes went into effect after community meetings earlier this year. Officials hailed the final alternative as a “compromise solution” that would create a safe east-west bike route and address road safety concerns. In a statement, a spokesperson for the county’s transportation department said the county does not expect the new roadway procedures will generate additional traffic, despite development in Reston. But, in neighborhood groups and online platforms, residents say they want a do-over: returning the lanes to the original four-lane configuration.